Conceived over 25 years ago, Franklin the Turtle is enjoyed by children and parents in over 50 countries and 30 languages. There are 100 titles in print with over 65 million books sold worldwide. Franklin developed into a successful television series that has been on air for over a decade and currently airs on top networks like TF1 in France, Treehouse in Canada and Nick Jr.. in the U.S. The popular theme song 'Hey, It's Franklin' from the TV show is one of the most recognized songs for pre-school children; this memorable tune was written & performed by Canadian star, Bruce Cockburn. The TV series has created an estimated 170,000,000+ impressions, and has a weekly audience in North America of approximately 200,000 viewers. 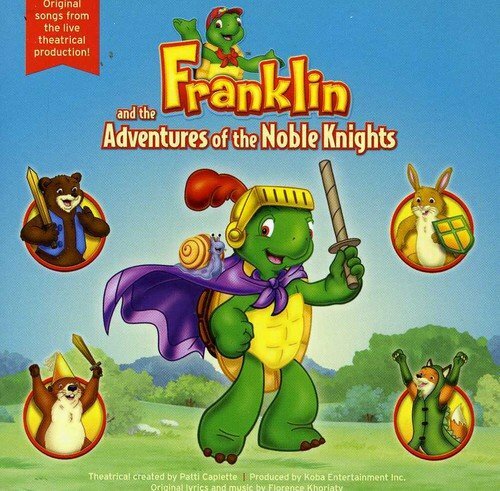 In 2009, a new touring show, 'Franklin and the Adventures of the Noble Knights' was developed and successfully toured to sold out audiences in France and as part of an extensive European tour. The show will premiere in Canada in Toronto on October 23rd, 2010 at the Sony Centre for the Performing Arts, and will subsequently be touring across North America. In this new Koba Entertainment production, 'Franklin and the Adventures of the Noble Knights', the audience is invited to join Franklin on a quest to recover the lost 'Golden Necklace' of Princess Harriet. Along the way, the gang must prove themselves worthy in an attempt to win the 'Silver Shield' - the most treasured prize of knighthood. The album features the music written and produced for the theatrical show, and unlike other CDs based on book and TV characters, this album is a story and a musical, using narration and original sing-a-long songs to tell a compelling story that will capture the imagination and hold the attention of children for the duration of the album. This album is the only audio album available that features the household name brand and character, 'Franklin the Turtle'. Children will delight in hearing all original music from the composer, lyricist, Florence K. An accomplished multi-linguist singer/songwriter, Florence K has recorded three albums, received a list of awards and has captivated audiences around the world. Parents and children will find themselves singing, dancing and clapping their hands to the music as Franklin and his pals take them on a musical flight of fancy and imagination. The CD is sure to engage and captivate the young and young at heart.